Nearly two decades of ‘slow but steady’ struggle which sometimes looked like a ‘one-man’ show and labelled as ‘just a fan club’ by critics has surely turned the tables in one big show of strength. “The Lahore Jalsa” has shaken repeatedly tested corrupt giants. There is a fear in their tone, and you can sense it. – majority of the voters decide overnight to cast their votes due to pressure, fear or incentives like a day’s ration, sewing machines, or ‘Ghee ke dabbay’. True, along with the corrupt ruling elite, the silent majority is equally to be blamed for the mess. The majority who either do not know the power of their vote or cannot think of a reason to come out of their comfort zones to vote. They dwell in air-conditioned rooms, cars and offices, hardly knowing the problems of a common man, so why bother? I feel lucky to have witnessed a day when people, especially youth, from all social backgrounds, some wearing Shalwar Kameez and headscarves and others in jeans and designer sunglasses, some travelling by public transport and others in their valuable and comfy cars, some speaking the Lahori style Punjabi and others insisting on their ‘dude’ style English, all came out to gather in the heart of Punjab under Jinnah and Iqbal’s posters, Pakistani flags, National Anthem and songs on the 30th of October on Imran Khan’s call to be part of ‘Tsunami of change’. After carefully watching the big day in the history of Pakistan Tehreek e Insaf and the utter failure of media to ‘change the topic’ or turn a blind eye to the mammoth crowd, one wonders as to what has brought the sleeping silent majority out. Fifteen years is not a long time, keeping in mind the fact that a sport hero turned politician, with no roots in established political houses of the country, and with no experience of fraudulent short cuts, talks about dreams which this nation had probably dumped into cold storage for years. The critics may, very rightly, say that this big crowd doesn’t mean anything electorally and wouldn’t constitute a single seat constituency but it cannot be ignored or taken lightly that people from all walks of life, from labourers, hawkers, rickshaw drivers to educated youth from all colleges and universities including the most ‘westernised’ reached the uneven ground of Minar-e-Pakistan which most of the elite youth might not have been to in years. What was the motivation? What was the call for? The question is extremely significant. The ruling class has always talked about problems of common man but all we have seen is years of hopelessness, heaps of broken promises and blatant lies. No one has delivered. Standard of living changes after elections but only for those who reach the Parliament houses, ever expanding offices, ministries and ranks created every day. It has never trickled down to the commoners. The call to gather was for ‘change’. Imran Khan talks of the common man and he has delivered, although on a smaller scale (Shaukat Khanum and Mianwali University Projects). He talks of the ‘Rule of Law’. Having explored the Western culture and comparatively studying Islam, he takes pride in owning Islamic values and systems. He promises not to bow for anyone’s interest and keep the interest of Pakistan supreme. He opposes Pakistan’s alliance with US War on terror and condemns the innocent casualties as a result of US drone strikes in Pakistan. ‘Friends with all, slaves of none’ was his message boldly sent out from the stage surrounded by thousands of chanting and adrenaline pumped Pakistanis. And most important of all, he takes inspiration from the Qur’anic principles of social justice and equality, Iqbal’s philosophy of ‘Khudi’ (self-respect) and Jinnah’s concepts of Islamic democracy. He strongly believes in Pakistan being an ideological state based on Two Nation Theory , a concept disputed by westernised ‘liberals’ in the country who are bent upon labelling him as ‘Taliban Khan’. Call it wishful thinking, but if the right-wing hardliners do not see him ‘up to the mark’ and the secularists see him as a ‘Mullah’, the nation would look up to him as a moderate leader capable of establishing a modern Islamic state. So, Pakistanis want rule of law, and self-respect and a society based on Islamic principles, exactly the things promised by Imran Khan. That is why they came out in numbers to show their unconditional support. A ‘clean sweep’ in coming elections still looks unrealistic for Pakistan Tehreek e Insaf. However, by joining hands with honest forces, without compromising his principles, Imran Khan is capable enough to change Pakistan for better. You have expressed very well how Imran khan gave voice to the wishes and aspirations of common pakistani man. And the crowd in the Lahore Jalsa was a clear depiction of the fact that “pakistani Awam” are now tired of old faces and fake promises. Aisha you have so rightly expressed how we all felt. I dont know anyone who had no friend/ cousin/ colleague/ neighbor/ university mates/ students/doctors/teachers…..who was not present there at the Tsunami Jalsa. 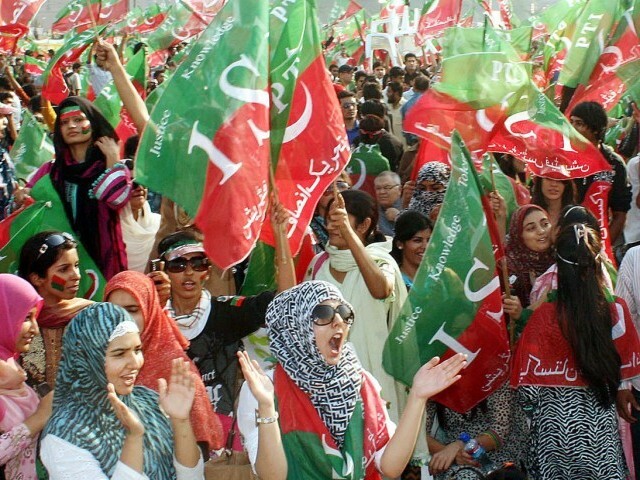 Yes the youth of Pakistan wants and is ready to strive for change. We have had enough of rubbish and humiliating political cartoons ruling over the country. its time we take the control and move with a focus to reach a point where this cartoon channel can be changed forever! i still at times sit back and dream of the day of the big Jalsa, watching the roaring and energetic crowd who had gathered at the Minar-e-Pakistan, Minto Park, chanting the slogans of Pakistan Zindabad, wishing to be there, having tears in eyes watching my lil 4 year old nephew getting on the sofa and singing the national anthem along with the rest in Lahore. I felt so much love for my country and had such a deep pain which left me spell bound. I wished to speak to all the others around my silent neighbourhood, what will take to awaken them before its too late! Seeing my little nephew chanting the song, Mei tu deikhon ga…brought a fresh wave of hope, that InshaAllah these buds of our future will make the dream of Iqbal and Mohammed Ali Jinnah come true even if it looked bleak in the very near past! Move on Imran, your tigers are at your back! well , long way to go but the revolution has begun , it;s the high time to bring professionalism and democracy within the party. Imran khan is not in business of importing people from abroad so he doesn’t have saints in his party , ppl are pulling legs and appointing friends and family at a pace as they have realized Khan’s time has come. Khan should be aware of all those who are sincerely working for the cause and others who are there sighting a big chunk of interest when party comes to the power , there are reports that elements within the party are involved in using party funds to run their lives . Some say criteria of having a seat in CEC is to buy an expensive plot in Banni Gala from a High profiled party office bearer , and that ll guarantee your CEC seat and more. He can only come through mass movement, not with elections. Its impossible for the outsiders and the pseudo liberal class to accept that someone would come and implement shariah. Elections will remain corrupted, Pakistan can only rise again through mass movement. Allama Iqbal was always in favor of an Islamic state which would be under Caliphate form of Government. Iqbal wanted spiritual democracy, a kind of khilafat-e-rashida and he totally opposed the western capitalistic democratic system. Very well written. The bottom line is, Imran is (with all his flaws and weaknesses) the one and only beacon of hope that the moths of our desperation are being drawn to. He offers hope and the only other available option is despair. The others, whether it be PPP, PML-N, MQM or any of the others, offer only corruption, mismanagement, ineptitude, nepotism, cronyism, economic ruin, inflation, unemployment, an energy crisis, global isolation and, ultimately, a failed state. Certain elements in the media have been critical, and I have written about that in my blog (RedWishDotCom.wordpress.com), and I have to agree that there are deficiencies in the detail that Imran and PTI have shared with respect to their policies, and I have to agree that some areas of their policies are, prima facie, flawed. However, broadly speaking, his vision is compelling and he is probably the only one who has been successful in articulating a vision for Pakistan. Even more importantly, he is the only one who we can trust to faithfully and diligently make an effort to formulate and execute strategies to achieve that vision. That is exactly what I’ve been telling people for years!! Its really good to see your write up on what can be easily labelled as a bias by many others. But I think it is no more possible to lean on the fence and see things drift away. It is time to voice our conscience, to use our knowledge for educating the illiterate of their rights and responsibilities. Modern technology has given us the strings to make a far reaching impact. Our writings and preaching can convince many if logically correct and aspire for a better living for the common man. Its time for change. Its time for meritocracy, integrity and accountability. Thank you Imran for inspiring the youth to become political and determine their destiny and rid us of the political curmudgeons. Thank you author for being an agent for change.